#293 "Stede Bonnet, Dettingen - June 1743, Sharpe's Bridge"
We kick off this month’s Giant Wargames theme content with an article by Last Argument of Kings author Pete Brown - a report on The Worcester Wargames Club’s re-fight of this War of Austrian Succession battle. 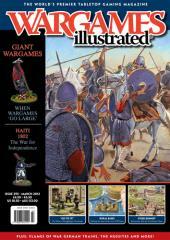 Our second Giant Wargames article. Thanks to the photography of Joe Dever we get to see the massive table and collection of Ron Ringrose in action as Germanic tribes strike hard and fast against Roman forces straddling the Rhine during the decline of the Western Empire. We conclude our Giant Wargames theme with a report on a 16 player, 6,000 figure and 438 square foot ACW game, played out at a unique venue. In WI291 we took a look at captured armored trains in German service. This month Wayne Turner takes a look at the Germans’ own design, the BP series of armored trains. Chris Peers goes beyond the archetypal image of the desert-trekking French Foreign Legionnaire and explores the actions of these hard fighters in sub-Saharan Africa. Including army lists for Death in the Dark Continent. Following the popularity of their rubble bases, Battlefront have released a second set of sculpted plastic bases, this time designed for a rural setting. In this article James Brown shows us how to customize, paint and get the most out of the new bases. Toussaint Louverture, Haiti’s War for Independence and what they have to offer the wargamer. The author of Kampfgruppe Normandy provides us with a new army list for the game: The British Airborne Division Battle Group, and a scenario. Richard Clarke, of Too Fat Lardies, presents a scenario for their game Sharp Practice. Can Sharpe and his Rifles hold off the French long enough to blow up the bridge? When life in Barbados got a little boring for plantation owner Stede Bonnet, he commissioned a ten-gun sloop named Revenge and become a pirate. Here we present four scenarios for refighting the historical battles of The Gentleman Pirate using the Legends of the High Seas rules. PLUS we pay a visit to the Warfare show (UK), Paul Davies shows us how to build a Watermill, and we look at some more Great Warriors, the Hussites. You can find our March Reviews online.